Camp Douglas Smith is on Hamlin Lake positioned almost midway between the shoreline towns of Ludington and Manistee. This position leads to great opportunity for a large variety of activities. Your on a lakeside retreat; you do what you want! Hamlin Lake offers plenty of local boat rentals, including kayak, canoe, and pontoon rentals. 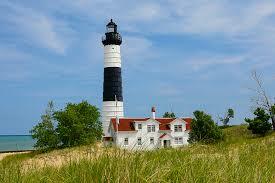 Right on the west shore of Michigan, we have many opportunities for beaches and parks!